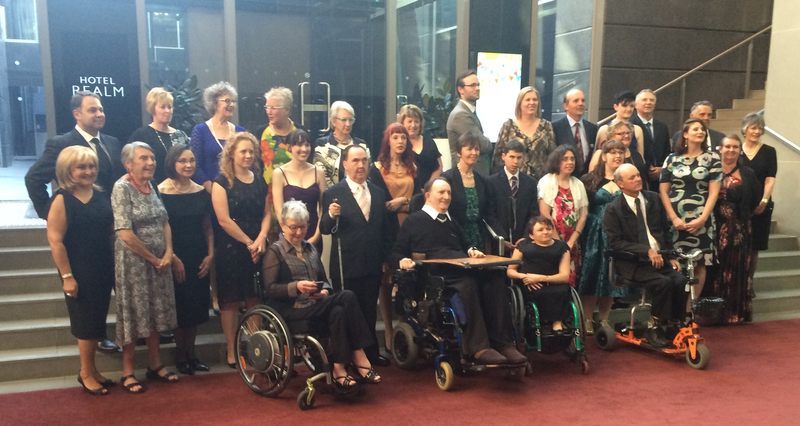 Last night in Canberra, I was the joint recipient of a 2015 National Disability Award as Emerging Leader in Disability Awareness. All winners were asked to give an impromptu speech, and although I managed to, I was very emotional, and found it quite difficult to say all the things I should have said! I forgot to thank my husband Peter Watt and my sons for their undying support and encouragement, and also forgot to thank so many others. Hopefully I did say that this award means a lot to me most of all because it recognises the 47 million people with dementia in the disability space, which is where we rightfully belong, just as any other persons with any other disabilities are recognised and supported. We have a human right to better care and support, and away from Prescribed Disengagement ®, and with continuing advocacy, people with dementia will be recognised globally under the United Nations Conventions of the Rights of persons with Disabilities (CRPD). Currently, Scotland is the only country I know where we are actively recognised under the UN CRPD. The picture I have added is of all the finalists, and as suggested by my dear friend Lynda Henderson who nominated me, her partner the wonderful Veda Meneghetti both involved in the Kiama Dementia Advisory Group, and my BUB, I did end up wearing a ‘little black dress’! This award is for all current and emerging members of Dementia Alliance International, for the 47 million people currently diagnosed with dementia, and for those who are receiving a diagnosis today and into the future. At the global rate of a new diagnosis every 3.2 seconds, this is perhaps the most important recognition dementia can receive. Thank you to the organisers, and to the judges for this important recognition. Congratulations darling Kate. This award again reinforces to us all how crucial it is to listen to those who actually live with dementia. Only those who live, day by day within this reality, are the experts. You are an inspirational, shining, sparkling light to those people who live with dementia, but also to those working in the field. You provide hope. You provide reality. But most of all you show us all, how living with dementia does not mean losing oneself. Well done Kate you deserve every award you receive. I am giving you my personal award, yet again, for helping me to be a supportive Care Partner. Thank you so much. Thanks Paul… and keep on being amazing too! Hi Kate, congratulations! Keep up the good work, you are doing a great job. Again, congratulations. And don’t you know how grateful your husband and sons are! Thanks Michael… and YES, I definitely know they are proud and love me! It is never them who says, ‘hey, you forgot to thanks me’, it is me being hard on me!!! Congratulations Kate! for working so tirelessly as an advocate for people living with dementia and to demonstrate there can be a life of ongoing purpose, meaning and amazing potential beyond a diagnosis. Well done for all those who don’t have a voice. My pleasure Pamela, and thanks. I had a feeling this time had come, dear Kate. I’m beaming!! Congratulations Kate! For your great job for people with dementia is a great movement for every one with or without any disability. And you look very smart in your black dress! Congratulations Kate! So well-deserved. You are doing such a great job for people with dementia. Thank you. Thank you Janet … it is, I feel, the beginning of the beginning for the disability and human rights of all people with dementia, now and into the future.